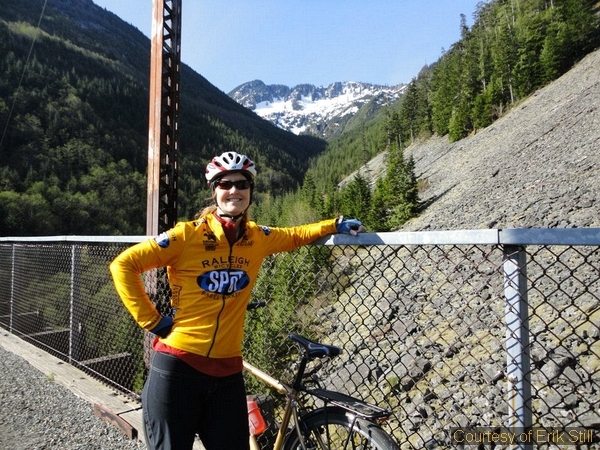 The blogs have been buzzing about the prospect of the Pacific Crest Trail (PCT) being opened to mountain bikes. It’s an emotionally charged issue for both sides – those who are alarmed by a perceived threat to the serenity and uniqueness of the PCT, and those who feel unjustly denied the right to ride those special trails. The objective of this article is to provide a factual basis for readers to evaluate the issue so that they can be informed and effective participants in the anticipated decision process. As the word got out about the requested review process, a flurry of passionate, even heated, exchanges began to appear on hiker, equestrian and mountain biking forums, from advocates on both sides. Clearly this issue has struck a nerve. In a cursory read of the comments, many mountain bikers feel discriminated against on trails built and maintained with their taxpayer dollars and volunteer time and that they’re increasingly being stereotyped and unreasonably denied access to the best miles of high country trails, out of selfishness, intolerance, outdated thinking or an extreme preservationist mentality. Many hikers and equestrians, having experienced trail damage and scary encounters with mountain bikes on narrow trails, feel that land managers, driven by the powerful mountain bike lobby, are opening too many trails already in an unrealistic quest for a ‘shared use’ ideal which will ultimately destroy their experience of solitude and quiet nature in the backcountry. Obviously, most readers are somewhere in the middle. However it was also obvious that very few people were operating against the actual facts of the situation.In 2012, the leaders of the PCT Reassessment Initiative apparently received word that the USFS could initiate a formal review process “as early as March of 2013”. 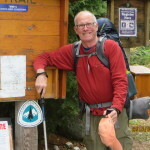 According to Jack ‘Found’ Haskel, Trail Information Specialist for the Pacific Crest Trail Association, “The issue is not at the stage of having proposed changes for consideration or public comment.” However, recently some comment periods for proposed federal rule changes have been as little as 30 days with minimal advance notice. Comments and active user involvement really do have weight in matters like this. It’s essential that trail users with concerns about management of the PCT get up to speed on the facts of the situation and ready themselves to participate effectively in the decision. How might this play out in Washington State? As pure conjecture with no intent to express an opinion, let’s say the Closure Order was rescinded and the CDNST approach was applied to the PCT. After a review against the Federal Wilderness map (www.wilderness.net/map.cfm), it’s obvious that there are few sections of the PCT in Washington not already protected by Wilderness designation. [The Wilderness Act of 1964 and subsequent statutes clearly exclude motorized and mechanized forms of transportation in Federal Wilderness.“Except as specifically provided for in this Act, and subject to existing private rights… there shall be no temporary road, no use of motor vehicles, motorized equipment or motorboats, no landing of aircraft, no other form of mechanical transport, and no structure or installation within any such area.” It seems very unlikely (though the mountain biking advocates are pushing this hard also) that Federal Wilderness statutes will be modified to allow access to bicycles.] In fact nearly all of the remote alpine sections are protected already. [It is obvious from Wilderness maps that Wilderness boundaries along the extent of the PCT have been drawn specifically to include the trail along much of its length.] The only non-Wilderness sections extend from Pyramid Peak to Snoqualmie Pass; from just south of the North Cascades highway north to Robinson Creek; and through some extended, heavily-roaded sections between Mount Adams and the Columbia River. Interest by mountain bikers could be fairly high on these sections because much of this country is readily accessed from forest service roads, though they’re unlikely to satisfy the yearning for the best high-country trails. While I don’t know these sections intimately, where trail attributes include good wide tread, a steady grade and long sight distances – all good design features for ‘shared use’ trails – with a lifting of the Closure Order and an approach like that on the CDNST, USFS unit managers could easily decide to grant mountain bike access on these sections in the face of heavy advocacy. However, while not wanting to offend passionate advocates of these particular trail sections, the impact on the broader population of current PCT users in Washington would seem to be far less than might be perceived at first blush. Still, section hikers and equestrians passing through this patchwork of trails could experience days at a time where their quiet experience would be interrupted by the passage of bicycle traffic (as, in fact, they already do when the trail passes through a developed area or a narrow private easement). Oregon’s PCT miles seem likewise to be mostly protected by Wilderness designation, other than some sections in the northern part. 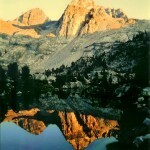 Likewise, the PCT through the central High Sierra in California is protected as Wilderness. In contrast, much of the PCT in northern and southern California is not in Wilderness. From the PCTA website, some of the same sections are facing even more alarming threats from incompatible use by private landowners on adjoining parcels (logging, mining, dumping, development), and easements through much of this land are narrow, sometimes not much wider than the trail. The USFS has been struggling to get enough dollars allocated through congress to purchase additional rights of way, though bills are in process and the PCTA and legislative partners are pushing hard for the additional support. So this story is certainly different from the stark high-stakes “win-lose” conflict that might initially be perceived based on a reading of the comment strings on user websites. Still, even recognizing the limited extent of non-wilderness miles available on the PCT, mountain biking advocates are eagerly pursuing access to these remaining miles based on legitimate arguments founded on statutes and precedents, and there are equally valid arguments to support hiking, equestrian and resource stewardship interests who want to maintain the ban. 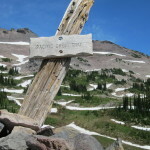 The Pacific Crest and Appalachian National Scenic Trails were established in the National Trails Systems Act of 1968 as “extended trails … to provide for maximum outdoor recreation potential and for the conservation and enjoyment of the nationally significant scenic, historic, natural or cultural qualities of the areas through which [they] may pass.” The Continental Divide trail and others were also recommended in the Act for consideration, later formally designated. The Act also states that, “potential trail uses allowed on designated components of the National Trails System may include, but are not limited to, the following: bicycling, cross-country skiing, day hiking, equestrian activities, jogging or similar fitness activities, trail biking, overnight and long-distance backpacking, snowmobiling, and surface water and underwater activities.” The Forest Service carries the lead responsibility for managing the PCT. However, the Comprehensive Plan also recommended a management strategy for the PCT on Federal lands outside of Parks and Federal Wilderness which promotes “experiences associated with the middle of the opportunity spectrum: i.e., semi-primitive, non-motorized and motorized, roaded —natural, and rural”, deliberately not choosing an emphasis on ‘primitive’ uses only. Further, “the management of the various resources will give due consideration to the existence of the trail and trail users within the multiple-use concept.” At that time, the managers of the trail were preoccupied with an entirely different set of ‘multiple use’ concerns including land management activities such as logging, forestry and mining as well as off-road motorized vehicles; bicycles had not yet taken off as a major recreational trail use. So, from a statutory and regulatory perspective, the guidance for its managers was ambiguous – the original Act put hiking, backpacking, trail biking and snowmobiling on an equal footing, all to be considered as potential uses against the intent to “provide for maximum outdoor recreation potential and for the conservation and enjoyment of …nationally significant scenic, historic, natural or cultural qualities.” Language establishing foot travel and horseback riding as primary over the other uses came later as an internal regulation, and even then, seems watered down by vague language in the Comprehensive Plan. As mountain bike use increased dramatically through the 1980s and 90s, “share the trails” initiatives by national, state and local mountain biking associations, coupled with pressure on public land managers to broaden ‘multiple use’ policies, resulted in the explicit opening of more and more public trails to mountain bike use. Popular trails, especially those near urban areas, soon began to experience high usage and the beginnings of resource and user issues. By the late 1980s, based on real or anticipated user conflicts and environmental degradation attributed to increasing mountain bike use on hiking trails, managers of trail systems around the country began selectively closing trails to mountain bikes. Having little experience with bicycle use on trails and likely alarmed by rapidly escalating usage and real or potential issues, the Forest Service imposed a Closure Order in 1988 banning the use of bicycles on any part of the PCT. The ban has been maintained and enforced since its inception, and has remained unchallenged until the 2010 request for review by the PCT Reassessment Initiative. Allow mountain bikes on the PCT? The National Trails System Act does not differentiate among hikers, equestrians and mountain bikers as ‘potential users’ for the National Scenic Trails, except as they might differ in impact on the overall objectives for the trails. The power to decide these access issues is clearly given to local USFS unit managers for their local trails in consultation with the other agencies involved. Even the subsequent USFS regulations putting hiking and horse users first still emphasize multiple use and do not mandate excluding bicycles from trails. In addition, there is precedent for national park and national forest supervisors working with their local user groups to successfully identify portions of a National Scenic Trail for shared use where it is expected to cause minimal conflict or compromise to scenic and environmental resources or other users. As mentioned above, the 2009 Comprehensive Plan for the Continental Divide National Scenic Trail was approved including the statement that “bicycle use may be allowed on the CDNST, using the appropriate trail design standards, if the use …will not substantially interfere with the nature and purposes of the CDNST.”, i.e., “high quality scenic, primitive hiking and horseback riding” and the “conservation of natural, historic and cultural resources.” It’s critical to point out that this new language was NOT an unrestricted opening of the Continental Divide trail to mountain bikes. 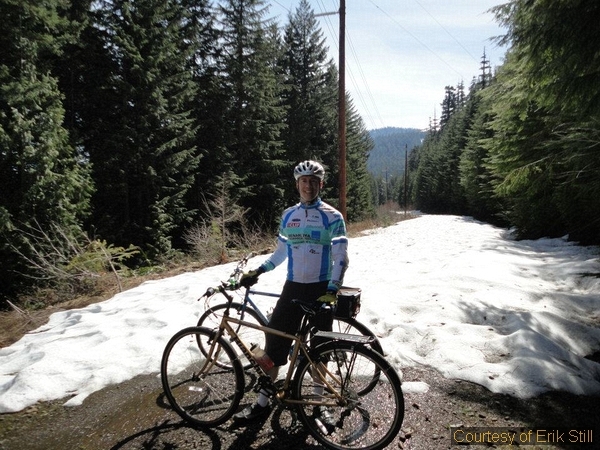 It only reinforced the responsibility of USFS unit supervisors to consider mountain bike access where it could be found consistent with the defined “nature and purposes” of the trail. So, based on this assessment of the statutes, regulations and precedents, there is justification for a challenge of the Forest Service’s blanket ban on access by mountain bikes to any portion of the PCT. So, are mountain biking advocates correct that the PCT is a “public trail that belongs to the entire community of quiet non-motorized travelers,” implying that the entire non-motorized public should have full freedom of access to the entire length of the PCT, or even the non-Wilderness sections? The answer to this question seems to be a fairly clear, “no.” It’s been well established by statute and upheld in court that local USFS and NPS managers have the statutory authority to determine what trail segments, if any, can be opened to mountain bikes, based on their best good-faith assessment of the compatibility of mountain bike use with other users and resource protection. At least one Federal court case [Bicycle Council of Marin vs. Babbitt, 9th Circuit, 1996] and a significant body of survey evidence from USFS and National Park Service unit managers found ‘ample evidence’ that off-road mountain bike use can lead to significant public safety, resource protection and user conflict issues. Some well-considered closures of certain trail segments to mountain bikes (and in some cases even to horses) seem well justified by law, land management policy and experience. At the end of the day, the regulations are clear and the courts have upheld that USFS and NPS land managers do have the authority to issue a closure order without public comment in cases where they perceive urgent public safety or resource damage concerns. So there does not seem to be valid procedural grounds to reverse the ban. Or even to force it into a public review. Overwhelmingly the arguments for maintaining the ban focus on upholding existing USFS regulations to protect the experience of hiker and equestrian users and the original National Trails System Act’s mandate to protect the “nationally significant scenic, historic, natural or cultural qualities” of the environments through which the trail passes. Even if local land managers have the authority to designate some sections open to bikes if such use is determined to be ‘compatible’ with the primary purposes of the trail, can such use truly be compatible on any portion of the PCT? While individual studies raise furious debate, and some ‘controlled studies’ have shown little incremental impact of mountain bikes on trails, as mentioned above it has been established in multiple surveys and more than one court case that shared use by mountain bikes with hikers and/or horses can result in an appreciable incidence of trail damage, injuries and conflicts on some trails. Certainly many hikers and equestrians can relate to reports of people having been run down or spooked by inconsiderate, speeding mountain bikers, and many land use managers and users have reported trail damage attributable to heavy and inappropriate mountain bike use. Inappropriate use may not be a reasonable basis to judge a whole user group, but inherent in the mountain biking experience is a higher travel speed under normal use than hikers and horses, introducing safety concerns that cannot be ignored, particularly on narrow trails like the vast majority of the PCT where there is little room to pass. [It’s commonly joked that the PCT is “2,663 miles long and 18 inches wide”.] Even infrequent incompatibility is still incompatibility, and one cannot expect to eliminate every inappropriate use regardless of the effort spent on training, signage and enforcement. It is often the case that trails with significant mountain bike use are soon abandoned by hikers and horses, making them de-facto single-use trails. In addition, even the 2009 CDNST Comprehensive Plan emphasizes that “appropriate trail design standards” are a requirement for opening trails to bicycles. There is a major discrepancy between the published literature and the IMBA’s own rules for safe singletrack trail design, and the actual on-the-ground design of the patchwork of trails making up the PCT, particularly in the backcountry. As mentioned above, many mountain biking advocates are particularly interested in opening many of the most remote high-alpine stretches of the trail, for the same reasons that hikers seek them out: they’re un-crowded and incredibly scenic. However, many of these trail sections are narrow, steep and winding, with blind corners, short sight distances and little room for passing. The safety consequences of a surprise interaction between a biker and a hiker or horse could be serious, with rocks and drop-offs destined to severely injure either party if they fall while trying to avoid the other, even if the bike is traveling at a relatively modest speed. Even on straighter sections, the speed differential between a bike and a hiker is sufficient, on some narrow trail segments, to create significant potential for conflict and/or injury. The question cannot be whether it’s compatible in an idealized situation, with only trained and careful riders and ideal shared-trail design and conditions; the question is whether it can be proved compatible in the real world of the PCT under typical trail conditions and user behavior. So, while one may argue that it is possible for a careful rider and a vigilant hiker to avoid injury, and many do on current shared-use trails, it seems an unavoidable reality that the probability of safety incidents and injury would be significantly increased if the ban on mountain bikes was lifted on many sections of the PCT. Finally, many also argue that the PCT stands as one of only a very few officially designated National Scenic Trails, defined based on their attributes of quiet, serenity, undisturbed nature and escape from the mechanized world over their entirety of the trail. It certainly seems that it was the intent of congress to protect its users and one-of-a-kind resources under consistent standards throughout; otherwise, why set up a National Trails System at all? This argument was not articulated by the USFS as a basis for their ban, but the PCT’s existence as a National trail argues that there must be national oversight over individual land managers’ access decisions to ensure consistent protection of user enjoyment, safety and resources along the entire trail. Once this end-to-end quiet, non-mechanized experience is compromised with piecemeal trail opening to mountain bikes, it could be argued that the trail as a national entity no longer delivers on those values. There has not yet been a formal announcement or call for comment related to a USFS review of the 1988 Closure Order. It is unlikely, however, that the IMBA or their constituents will let the matter drop. It is strongly in their interest to continue to push back on trail closures wherever they occur. The PCTA, the IMBA and the PCT Reassessment Initiative websites are likely to communicate any action by the USFS when it occurs. Interested users should keep a close eye on www.pcta.org and www.sharingthepct.com for updates. When this happens, interested current and potential users of the PCT have a great deal at stake and would be strongly encouraged to provide comments, early and often as the bulk and balance of comments matters in these agency decisions. Hopefully the background and synopsis above will help to inform readers to present knowledgeable and thoughtful comments. In closing, I’d like to reiterate that this debate about mountain bikes goes on in the context of other, perhaps even greater threats to user experiences along the PCT. As the PCTA describes effectively in their website, “while technically located on federal land or right-of-way easements across private land, the PCT is far from being protected from urban encroachment or the ravages of resource extraction. There are 307 miles of private land right-of-way easements between Mexico and Canada, many as narrow as eight feet, and some even less…currently, passage is usually permitted; however, trail conditions and user experiences vary widely on these easements. There are dangerous road-walks, hazardous logging operations, ski and other incompatible commercial areas, residential areas, trash problems, and a host of other activities and situations never envisioned when the National Trails System was created in 1968.” In addition, users of the PCT and many other exceptional trails have found road access to those trails steadily deteriorating due to lack of maintenance, sometimes due to Wilderness designation and sometimes due to lack of funds. As one thoughtful commenter on the PCTA website points out, “more users = more advocates = more voices = more trailheads being open = more roads open.” Other commenters have pointed out that sharing the PCT with mountain bikers would bring more volunteers and advocates to the table to fight for the funding to expand and easements and maintain the trail and key access roads. So, while I admit to being personally, viscerally opposed to mountain bikes on the PCT, I am likewise opposed to the steady decline and closure of key trail-access roads and the presence of trail easements so narrow that mines, houses and logging operations press right to the trail. 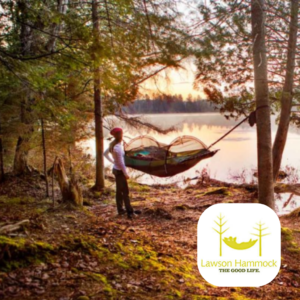 All users must think big-picture and put their voices and actions to those steps which provide the most benefit against the critical goals of protecting quiet, primitive outdoor experiences and protection of one-of-a-kind scenic and natural resources. Be informed. Listen. Think. Participate. Encourage cooperative rather than polarized behavior. We all agree on the precious and unique value of the PCT and owe it to our grandchildren to act today so that it is maintained and enhanced for them to treasure as we have.